This information is provided to assist all users in understanding the Hop Dip Galvanizing (HDG) Process and the Design of products to be Hot Dip Galvanizing. 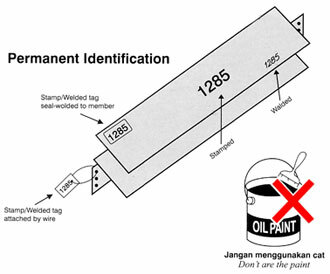 The information provided is taken from several sources included article from AGI (Association Galvanizing Indonesia) and AGA (American Galvanizers Association). 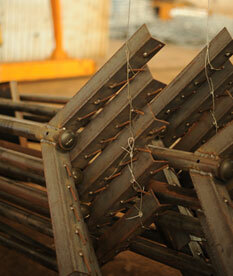 Galvanizing is found in almost every major application and industry where iron or steel is used. The utilities, chemical process, pulp and paper, automotive, and transportation industries, to name just a few, historically have made extensive use of galvanizing for corrosion control. They continue to do so today. For over 150 years. Hot Dip Galvanizing has had a proven history of commercial success as a method of corrosion protection in applications worldwide. 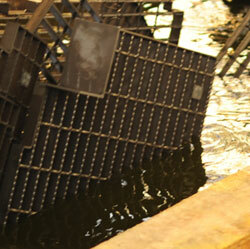 Protect steel material from corrosion for a long period of time. The DPN is a Progressive measure of hardness the higher the number the greater the hardness. 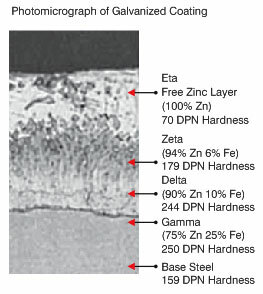 Typically the gamma delta and zeta layers are harder than underlying steel. The hardness of these inner layers provides exceptional protection against damage through abrasion. Hot Dip Galvanizing guarantees a uniform coating thickness on all coated surfaces, including edge,corners, and threads, inside tubular sections and in hard to reach places. This uniform coating eliminates any weak links and provides excellent corrosion protection at these critical points. sea water and high humidity. It can protect for more than 20 years, depending upon environment. 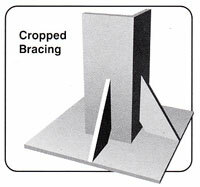 Cathodic protection allows an element such as zinc to act as the anodic area on the steel. As the anode, zinc preferentially corrodes, keeping the cathode (base steel) intact. 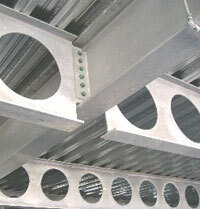 coating have hardness values that meet or exceed the values for most grades of structural steel. This make galvanized steel excellent for applications particularly susceptible to abrasion, such as stairs and walkways. DEGREASING : Removing oil or organic material. WATER RINSING : Removing chemical liquid from degreasing process. ACID PICKLING : Removing surface rust and mill scale. OVEN : Drying all surfaces before go. GALVANIZING : Material completely immersed in zinc bath with temperature 4450C - 4550C. 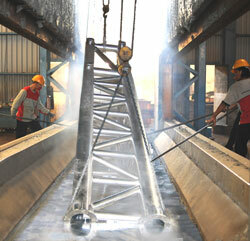 QUENCHING : Cooling as zinc surface final treatment. All material to be hot dip galvanized must be treated with care in order to avoid mechanical failure and minimize risk of distortion. 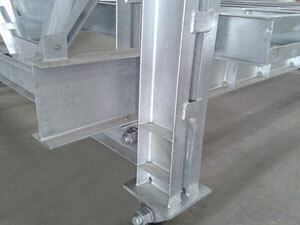 Material feature or design that can create problem during the hot dip galvanizing process must be informed in advance. Galvanizing parameter such as temperature, time of immersed and withdrawn from the bath must be adjusted according to the type of products. Zinc composition in the zine bath must consist of a minimum 98% pure molten zinc. Surface contamination or hard to remove layer which unable to be cleaned after the normal chemical pretreatment process can be removed using abrasive blast cleaning (sand blansting) or other method that suitable with the application. Work material must be cleaned before go through pretreatment process (pickling). ASTM A 123 (Amerika), ISO 1461 (Eropa) & SNI : 07-7033-2004 (Indonesia) Zinc (Hot Dip Galvanized) coating of iron and steel products. ASTM A 780 Practice for repair of damage Hot Dip Galvanized Coating. L 10.8 x W 1.6 x D 3.0 M.
Certain rules in fabrication technic apply in order to avoid distortion and protection against corrosion. 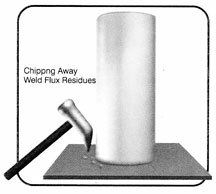 All weld flux residues must be chipped away or remove before sending to the galvanizing plant. 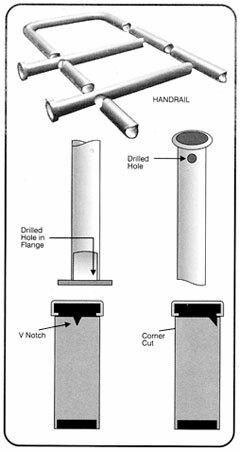 It is recommended, before material fabrication the designer and the galvanizer must agreed on the proper position of holes for venting, draining, and material handing. 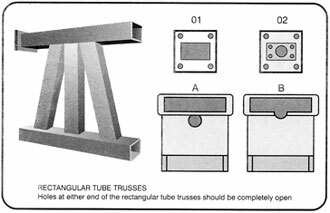 All unnecessary steel markers must be removed before sending to galvanizing, and the fabricator must consult with the galvanizer regarding removing all oil, grease, and paint before Hot Dip Galvanizing Process. 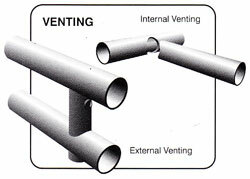 The primary reason for vent and drain holes is to be evacuated, permitting the object to be completely immersed into cleaning solutions and molten zinc. 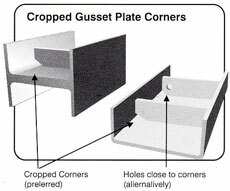 Proper sizing and location of the holes must be prepared during the product design before fabrication in order to make it safer to galvanize and provide the optimal finish. Proper galvanizing results when the inside and outside of a product are completely cleaned and zinc coated. The secondary reason is to prevent damage to the parts. 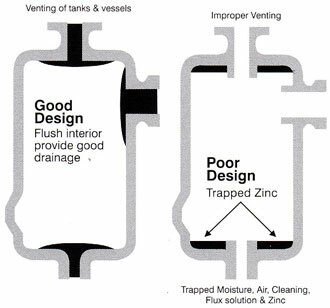 Any pickling solutions or rinse waters that might be trapped in a blind or closed joining connection will be converted to superheated steam or gas and can create high pressure when immersed in molten zinc. Not only is the risk of damage to the fabrication being galvanize, but there also is risk of serious hazard to galvanizing personnel and equipment.